Reinvent your decor style with this interesting throw sham. 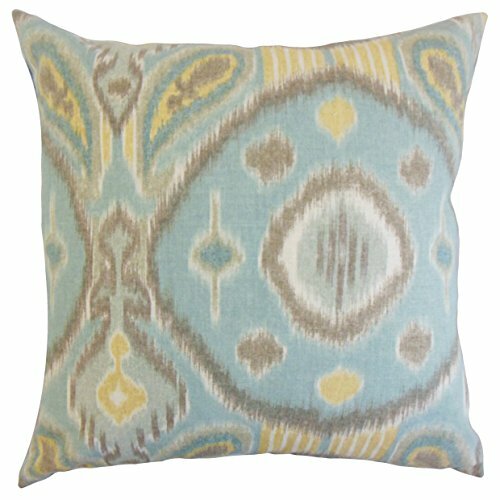 This accent piece features a unique ikat pattern in shades of blue, brown, yellow and white. This square sham is a perfect finishing piece on your bed, seat or chair. Made of 100% high-quality linen fabric. Crafted in the USA. More Details: Reversible sham with same fabric on both sides. ; Includes a hidden zipper for easy cover removal and cleaning. ; Comes unfilled and will accommodate any standardized Euro, standard, queen and king pillow insert. All four sides have a clean knife-edge finish. ; Made in the USA. ; Dry cleaning recommended. Hofdeco Decorative Throw Pillow Cover INDOOR OUTDOOR WATER RESISTANT Canvas Hot Pink Zigzag Chevron 18"x18"
The Pillow Collection KING-PT-SANDYPOND-SPA-L55C45 Fia Floral Bedding Sham, Blue, King/20" x 36"